The Third Estimate of our 3rd Quarter GDP from the Bureau of Economic Analysis indicated that our real output of goods and services increased at a 3.5% annual rate in the quarter, revised from the 3.2% growth rate reported in the second estimate last month, as personal consumption growth was revised higher, state and local government shrunk less than was previously estimated, and private non-residential fixed investment increased, rather than decreased as was previously reported. In current dollars, our second quarter GDP grew at a 5.0% annual rate, revised up from the 4.6% reported in the 2nd estimate, increasing from what would extrapolate to $16,583.1 billion annually in the 2nd quarter of this year to an annualized $16,727.0 billion in the 3rd quarter, with the headline 3.5% annualized rate of increase in real output arrived at after an annualized inflation adjustment averaging 1.4%, aka the GDP deflator, was applied to the current dollar change. Recall that the press release for the GDP reports all quarter over quarter percentage changes at an annual rate, which means that they're expressed as a change a bit over 4 times of that which actually occurred over the 3 month period, and that the prefix "real" is used to indicate that the change has been adjusted for inflation using prices chained from 2009, from which all percentage changes in this report are calculated, as those changes thus represent the change in the quantity of goods and services output nationally. Given the misunderstanding evoked by the text of the press release, all the data that we'll use in reporting the changes here comes directly from the pdf for the 3rd estimate of 3rd quarter GDP, which is linked to on the sidebar of the BEA press release. Specifically, we reference table 1, which shows the real percentage change in each of the GDP components annually and quarterly since the 2nd quarter of 2012; table 2, which shows the contribution of each of the components to the GDP figures for those months and years; table 3, which shows both the current dollar value and inflation adjusted value of each of the GDP components; table 4, which shows the change in the price indexes for each of the components; and table 5, which shows the quantity indexes for each of the components, which are used to convert current dollar figures into units of output represented by chained dollar amounts. The pdf for the 3rd quarter’s second estimate, which this estimate revises, is here. Meanwhile, seasonally adjusted real gross private domestic investment grew at a 3.0% annual rate in the 3rd quarter, revised from the 2.1% growth estimate reported last month, as real private fixed investment grew at a 0.1% rate, rather than shrinking at at a 0.9% rate as reported in the 2nd estimate, while real inventory growth was a bit less than previously estimated. Investment in non-residential structures was revised from growth at a rate of 10.1% to growth at a 10.0% rate, while real investment in equipment was revised to show contraction at a 4.5% rate, not quite as bad as the 4.8% contraction rate previously reported, while the quarter's investment in intellectual property products was revised from growth at a 1.0% rate to growth at a 3.2% rate. At the same time, real residential investment was shown to be shrinking at a 4.1% annual rate, rather than the 4.4% contraction rate previously reported. After those revisions, the increase in investment in non-residential structures added 0.30 percentage points to the 3rd quarter's growth rate, the decrease in investment in equipment subtracted 0.26 percentage points from growth, lower residential investment subtracted 0.16 percentage points from GDP, while growth in investment in intellectual property added 0.13 percentage points to 3rd quarter GDP.. Finally, there was an upward revision to real government consumption and investment in this 3rd estimate, as the entire government sector grew at an 0.8% rate, rather than at the 0.2% rate that was shown in the 2nd estimate, as there large were positive revisions to real state & local government consumption and investment, while federal government consumption and investment was revised a bit lower. Real federal government consumption and investment was seen to have grown at a 2.4% rate from the 2nd quarter in this estimate, revised from the 2.5% growth shown previously, as real federal outlays for defense grew at a 2.0% rate and added 0.08 percentage points to 3rd quarter GDP, revised from the 0.12 percentage point addition shown last month, while all other federal consumption and investment grew at a 3.0% rate and also added 0.08% percentage points to 2nd quarter GDP. Meanwhile, real state and local consumption and investment shrunk at a 0.2% rate in the quarter, which was revised from the 1.1% contraction rate reported in the 2nd estimate, and subtracted 0.02% percentage points from 3rd quarter GDP, rather than the 0.25 percentage point subtraction shown last month. Note that government outlays for social insurance are not included in this GDP component; rather, they are included within personal consumption expenditures only when such funds are spent on goods or services, thus indicating an increase in the output of those goods or services. Our FRED bar graph for GDP below has been updated with these latest GDP revisions. Each color coded bar shows the real inflation adjusted change, expressed in billions of chained 2009 dollars, in one of the major components of GDP over each quarter since the beginning of 2013. 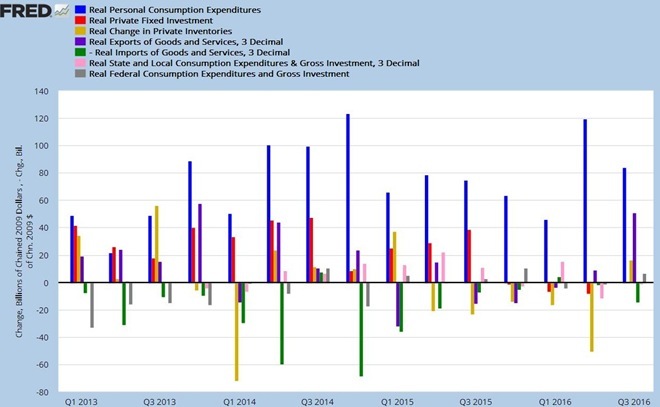 In each quarterly grouping of seven bars on this graph, the quarterly changes in real personal consumption expenditures are shown in blue, the changes in real gross private investment, including structures, equipment and intangibles, are shown in red, the quarterly change in real private inventories is in yellow, the real change in imports are shown in green, the real change in exports are shown in purple, while the real change in state and local government spending and investment is shown in pink, and the real change in Federal government spending and investment is shown in grey. Those components of GDP that contracted in a given quarter are shown below the zero line and subtract from GDP, those that are above the line grew during that quarter and added to GDP. The exception to that is imports in green, which subtract from GDP, and which are therefore shown on this chart as a negative, so that when imports shrink, they will appear above the line as an addition to GDP, and when they increase, they'll appear below the zero line. It's fairly clear from the above graph that the increase in exports in purple was a major and unusual contributor to making the 3rd quarter's growth the best in two years. Noting that, there have been many stories attributing that increase to a sudden surge of soybean exports, but that's only half the story. While we did have a record soybean crop, the jump in our soybean exports in July and August came out of inventories to meet an unusual out of seasonal Chinese demand. Since we normally don't export many soybeans during those months when the crop is still growing, those summer exports were spiked even higher by the seasonal adjustment to our trade figures. At the same time, soybean inventories were reduced, taking part of that gain back out of the inventory component of GDP. In the 4th quarter, most of that will be reversed; newly harvested soybeans will be added to inventories, adding to GDP, while diminished exports will be reduced even further by the seasonal adjustment that expects higher soybean exports in the late fall, thus lowering the export component of the 4th quarter GDP figures.. There is another trade report, but often there are other areas, such as gold being exported that rival the nominal value of soybeans. Although soybeans are a huge cash crop. Thanks for the overview. So nice the U.S. became the 3rd world agriculture exporter while we import expensive, completed durable goods.